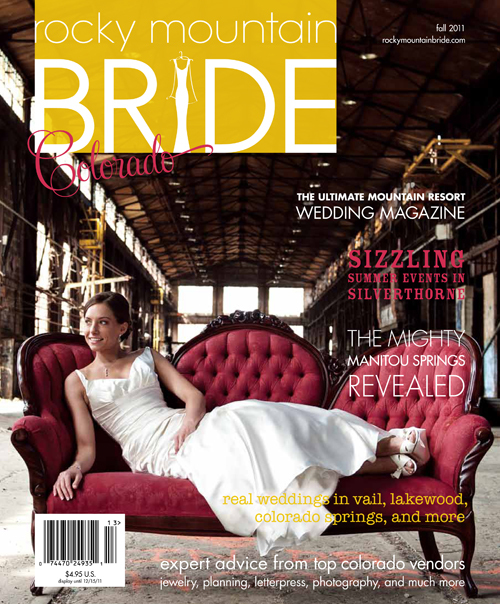 PRESS: On the Cover of Rocky Mountain Bride Magazine! So this week it’s time for a little more shame-less self-promotion… a photo from one of our company’s unique Off-Beat Bridal Portrait Session’s is on the COVER of this month’s issue of Rocky Mountain Bride Magazine!!! But how did this happen?! Now I’m sure some of you recall one of our photos being a finalist in a competition for the cover of the Summer Issue of Rocky Mountain Bride… I was so grateful and astonished at how many of my brides literally came out in FORCE to support us for that, emailing their entire contact lists to come vote for our cover, etc. As some of you may also recall, we LOST that competition, taking second place by a very slim margin. What we didn’t tell you was that the staff of Rocky Mountain Bride was so impressed with the number of votes our cover got, as well as the photo itself, they decided to make it the cover of their Fall/Winter Issue! And let me just tell you, We are SO excited about this, as Rocky Mountain Bride is one of the most well-known premier bridal magazine’s in the state and an awesome resource for brides! We also just wanted to take a moment to thank Kelly LoBrutto for participating in the awesome Off-Beat Bridal Portrait Session she won in our First Annual Dress-Off Competition. She was a real trooper, wearing her pristine Pronovias gown with a smile in a very run-down and – let’s just be honest here – dangerous location for a shoot. We weren’t able to share the photos and details from the session publicly until now, as Kelly didn’t want to be seen in her dress until after her late-July wedding, and at that point we figured, might as well wait for the cover… and so we have! To come check out the entire long-awaited-to-be-shared Off-Beat Bridal Portrait Shoot, click here! Thanks again both to Kelly, and the staff of Rocky Mountain Bride for making our latest press possible! See you all again the next time we have something to brag about, or check out more past press on our Press Page! Yay!!! I’m so happy for you!